We’ve all been there. Thinking we’re ahead of the game by purchasing chicken as our family’s protein element of choice, only to find ourselves still being a few pennies short of a balanced budget. When that happens, here are five money-saving chicken ideas to help make financial ends meet. These are routinely the cheapest chicken item on the market. Many regular grocery stores even offer them in ten-pound bags for as low as thirty-nine cents per pound. 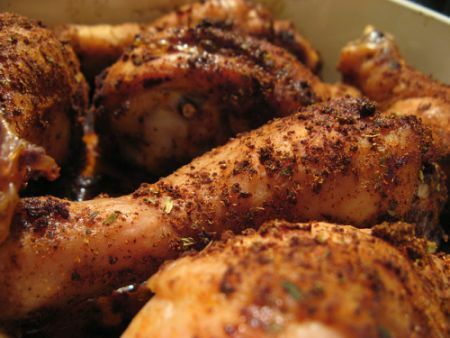 Even if you have to purchase them in the medium-sized family packs at the warehouse stores however, chicken leg quarters are a great financial deal for the family food budget. You can bake or boil the entire batch at once for a weekend meal, and de-bone all of the extra pieces to have on hand for extra meals throughout the week. You can also cut apart the full legs into thigh and drumstick portions and use them separately. This makes for an especially affordable barbecue gathering. When it comes to creative chicken ideas, starting with the full bird at an affordable per-pound price is a great strategy. You can bake the full Monty for Sunday dinner and save the extras for sandwiches later in the week. You can also butterfly it and cut it in half to bake up on two different nights during the week, or break it down completely into traditional portion pieces such as breast, wing and thigh. However you decide to go, starting with a whole chicken is definitely a great budget option. Homemade chicken stock is a huge money saver, and you can make your own by boiling leftover bones and bits that you’ve taken the meat off. Not the ones you’ve actually eaten from mind you, but the ones where you’ve cut off a serving piece with a sterile knife, taken off the breast meat to have boneless stir-fry, or de-boned an entire batch of leg quarters after baking to freeze ahead. All of those examples provide you with great fodder for homemade stock. Toss some bay leaves and your seasonings of choice into the water for extra flavor in your finished product. Use your stock in homemade soups, sauces, casseroles and more. Chicken stock is one of those foods that freeze well, so if you’re not sure what you want to do with right away, don’t worry. If pennies are truly tight, maybe serving up a full breast per person isn’t exactly the best way to keep your budget on track. Consider soups, fried rice, casseroles, chicken and bean burritos or topped salads as menu options instead. Anything that stretches one larger piece of meat into something that serves 4-6 people will do. If you’re worried about making a statement, make sure you have something else affordable on the menu that rocks. Jalapeno corn muffins or seriously spicy black beans are two fun examples that you can use to create affordable dinners. Rather than making chicken your main event, consider using it as a sassy side dish instead. Two-three hot wings or a single breaded drumstick paired with a baked potato and green salad are both things I’ve tried, along with baked chicken-nut puffs that I paired with green beans and sweet potatoes. As you can see, there are many money-saving chicken ideas you can use to serve your family creative meals. Feeling bored or deprived doesn’t have to be part of your dinner prep picture. Your blog is making me hungry these days. Also, preparing food in bulk and freezing the left overs is a great way to save money.